Bookbinders have often used waste material from broken and discarded books to make new ones. 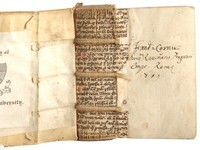 During the late fifteenth century numerous manuscripts in monastic libraries were replaced with printed copies, and the discarded parchment became useful material for new bookbindings. 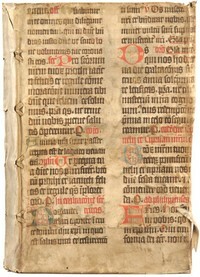 Many medieval manuscripts survive only as waste material reused in a subsequent bookbinding. Although today this reused waste is regarded as a valued element of a book, its first appearance represented a step toward economizing: a fresh, clean sheet of parchment or paper was not employed where a leftover scrap would serve just as well. Binding waste can be both visible and hidden. Book covers and endleaves composed of waste can be easily identified as such. Waste used as spine linings and as pasteboard layers becomes apparent only when the book is damaged in a way that exposes what lies underneath the current binding. The heavy use that liturgical manuscripts received probably meant that they were frequently replaced with new scribal copies. 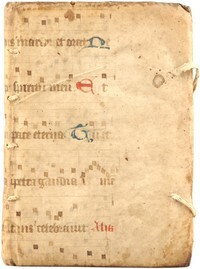 Discarded musical manuscript leaves are common as binding waste on books printed in the sixteenth and seventeenth centuries. 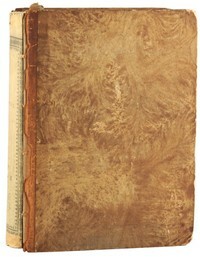 Title: M. Tullii Ciceronis Epistolae ad T. Pomponium Atticum. 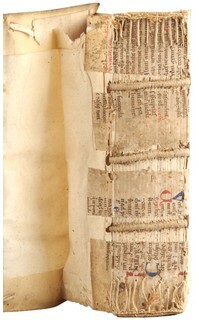 Another binding made of waste liturgical manuscript leaves. 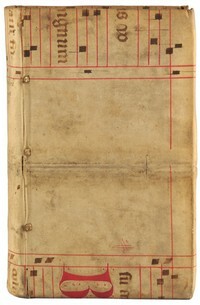 A fifteenth-century German liturgical manuscript as a covering on a Basel imprint from 1551. 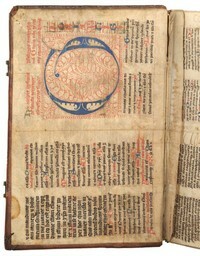 Title: Claudij Ptolemaei Pelusiensis Alexandrini Omnia quae extant opera, praeter Geographiam. Published: Basel: Henrich Petri, 1551. 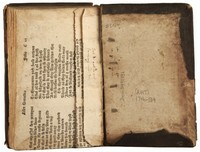 Printed waste from the press of England's first printer, William Caxton, as endleaves in this English binding of the late seventeenth century. Title: The tvvoo [sic] bookes of Francis Bacon, of the proficience and aduancement of learning, diuine and humane. Published: At London: Printed for Henrie Tomes, 1605. 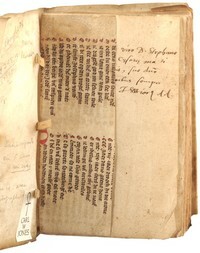 Several leaves from a French breviary as pastedowns and flyleaves in this early sixteenth-century binding from the lower Rhine region. Author: John, of Damascus, Saint. Published: Paris: Henri Estienne, 1507. 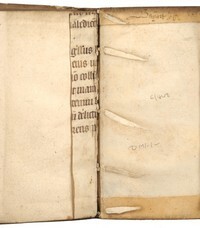 Both manuscript and printed waste have been widely used for spine linings over many centuries and in all regions. Published: Modena: Heirs of Soliani, 1693. 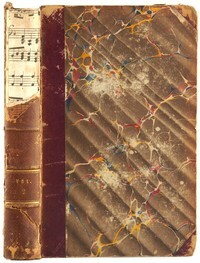 Another view of the previous binding. Title: Darnley, or, The field of the cloth of gold. 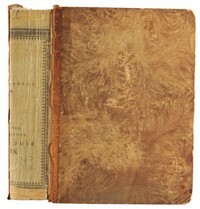 Published: London: H. Colburn and R. Bentley, 1830. Published: Roma: Heirs of Antonio Blado, 1569. Title: Bellum Catilinae & Bellum Iugurthinum. Published: Antwerp: Johann Gymnich, 1547. 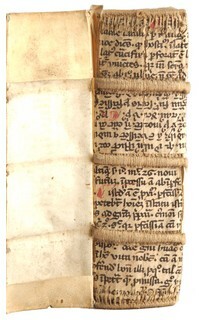 The toughness of parchment has made it a favorite material to reinforce sewing, both of the textblock sections and of the endleaf folds. Title: De praestigiis daemonum, et incantationibus, ac veneficiis, libri V.
Published: Basel: Joannes Oporinus, 1563. Published: Frankfurt am Main: G. Corvinus, 1575.